The farm is situated on the outskirts of the Szczebrzeszyn Landscape Park. 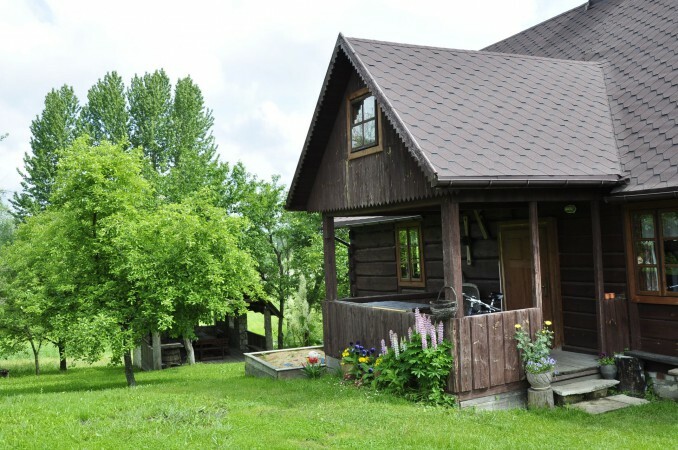 The house is beautifully located in the green nature of Roztocze, away from big cities or industry. The garden is a perfect place to laze about in, with a campfire place, a stone arbour, swings, roundabout and a seesaw and also with a vegetable garden and an orchard nearby. Guests stay in a stylish log cottage. Each room has its own bathroom and a terrace or balcony. There is also a big parking space. There is a separate kitchen for the guests’ exclusive use. We serve food using best possible local produce in a dining room where all guests meet on rainy days or during festivals. They make their own butter, bread, smoked meats, cheese and honey. Guests are encouraged to harvest cucumbers, lettuce or spring onions from the backyard garden. The most interesting natural attractions of the area are the loess gullies situated approx. 2 km from the farm. Nature lovers will enjoy walks in the country. Well marked path direct cyclists towards various attractions and the routes are very scenic with many places to stop and enjoy the sights, sounds and natural beauty along the way. In winter our guests ski in Chrzanów ski resort. Places worth seeing include St. Anthony Monastery in Radecznica, the remains of “Sutjesk” Chervien Grod in Sąsiadka, wooden churches in Gilów and Smoryń and naturally the Old Town in Zamość.